RFID Relay Controllers | GAO RFID Inc.
Our selection of Relay Controllers for RFID applications are designed to provide the ability to switch high-current loads, allow for lower current input signals, all while the status of each relay is communicated through LED indicators. GAO RFID provides a collection of relay controllers for RFID with different protocols that are designed to provide the ability to switch high-current loads and allow for lower current input signals, all while the status of each relay is communicated through LED indicators. The relay controllers for RFID ensure high performance and are available with two or four channel options. 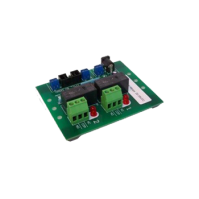 These TTL relay boards provide three different relay coil voltages (5, 12, 24 VDC) for selection allowing user’s to switch high-current loads such as AC appliances and motors. Also, the boards offer two or four SPDT relays and drivers with convenient screw terminal connections for the inputs and contacts. The relay contacts are electrically isolated from the rest of the board making the board a valuable tool for AC and DC loads. Other key features of the relay controllers for RFID include relay contacts rated for 15 A at 250 VAC, rubber feet or DIN rail mount and convenience for CNC projects. Additionally, these devices have an operating temperature range from -25 °C to 75 °C (-13 °F to 167 °F), an input control signals and power of 16 AWG to 26 AWG, and relay contacts of 12 AWG to 24 AWG. We provide relay controllers for RFID in different form factors and materials. Most of them are built with durable, resistant materials and come in convenient sizes. They also include active driver circuitry, which allow lower current input signals (such as 5V TTL) to be used. The relay controllers for RFID are suitable for different applications where it is necessary to switch current loads. These devices can be used in on all types of switching configurations including general purpose, multiplexers, and matrices. Looking for a relay controller not on our list? Our team of Experts are ready to help you find the correct relay controller for your application. This 2-channel TTL relay board provides three different relay coil voltages you to switch high-current loads. 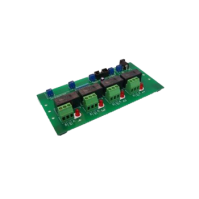 This 4-channel TTL relay board provides three different relay coil voltages allowing you to switch high-current loads.